I am fresh off the high from spending Saturday afternoon and evening with Sean Johnson and the amazing musicians of The Wild Lotus Band. We spent the beautiful five o’clock hour in Sean’s “Soul Flow” to the live accompaniment of Alvin Young on fretless bass and Gwendolyn Colman on percussion. I have discovered a new love, and it is practicing yoga to fretless bass. WOW (again). Sean had us connecting to source and clearing away our demons in a sweaty, fun, and powerful practice. 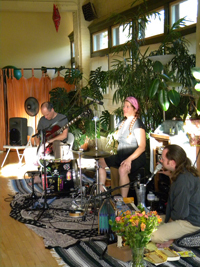 Having a chance to snack and drink chai between the class and kirtan helped us to refuel and create more of an intimate gathering when we began to sing. Sean and the band blew me away with their new music. They have put together a tight and powerful kirtan style that is easy and fun to join along with, even with no chanting experience. 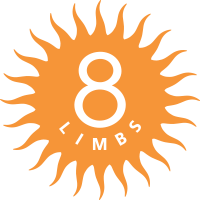 They were also blown away by our community, and felt energized and connected to 8 Limbs. We look forward to having them back AND hosting other musicians in the near future. June 18 at 5:45pm and June 19 at 4pm with Paul Millage (live music by Christopher, 8 Limbs Capitol Hill. June 22 at 7:15pm with Paul and June 25 at 10am with Anne Phyfe (live music during savasana with Steve and Anne-Emilie Gold). There is no “extra” charge for this music in these classes. Come and enjoy!